Macy's has just formally announced that British Designer Matthew Williamson will be the next Macy's Capsule Collection designer for their new Impulse line. Even more stunning, the Macy's prices will start at $50.00 US ( that's £31 for my UK readers) for his line. Bring it Macy's! The collection is expected in over 225 stores on April 13th. Some of you will remember Matthew's brightly colored Spring/Summer Collection for H&M which included swimwear and accessories. So what can you expect from Williamson's Macy's style? My spies tell me that there will be colorful separates and collectible 70s-inspired dresses priced from $50 - $120 US, with specialty pieces selling up to $300. Key items will include bold, graphic animal inspired print and embellished day and party dresses, bohemian blouses, printed scarves and flirty day-to-evening rompers, all with Matthew’s "iconic" styling. And you heard it hear first, look for Williamson's trademark peacock like colors and prints. 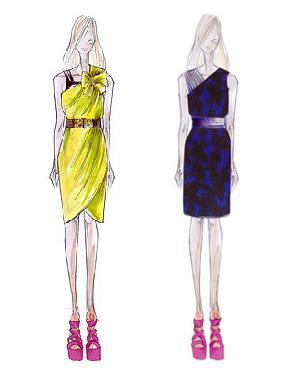 I can't help but think the yellow dress sketch looks a bit like a Lanvin. What do you think readers?